RBTH presents a selection of views from leading Russian media on the latest developments in Ukraine, including a clear declaration by Ukrainian President Petro Poroshenko of Kiev’s intention to seek EU membership, as well as news that Ukraine plans to offer Crimea a series of economic privileges, including recognizing it as a free economic zone. 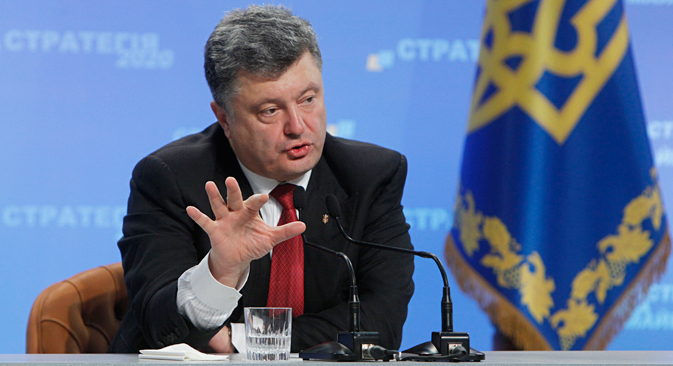 The Kommersant newspaper reports on President Petro Poroshenko's first major press conference. The newspaper believes that the truce that was reached on September 5 is frail and is being perceived as a tactical respite. However, Poroshenko, says Kommersant, is convinced that the war in the east is ebbing into the past. At the press conference the Ukrainian president announced his Strategy 2020 Development Program, whose leitmotif was a thesis on the immutability of the “Euro-Atlantic choice”. Kommersant says Poroshenko explained that on its road to the European Union, Ukraine must implement a package of 60 reforms by 2020. The newspaper's experts think that Poroshenko's announcement that Ukraine will submit an application to join the EU after the end of his presidential term seems to be "either immoderate optimism or the imposition of the opinion that the current president will serve two five-year terms." Having reached a truce in the Donbass region of eastern Ukraine, Petro Poroshenko has tried to assume the role of a builder of the new Ukraine on the eve of the October 26th parliamentary elections, writes the newspaper. "Poroshenko's announcement about his intention to apply to the EU in six years decidedly bears an electoral nature," says Kommersant. Expert magazine has published an article titled "What Poroshenko did not speak about," dedicated to Petro Poroshenko's first official press conference. The president was required to inform the citizens of the objective picture and admit that the civil war in Ukraine was the result of serious internal contradictions and the failure to realize a multi-ethnic national model. "If Ukraine continues to cling to this concept, it will not only lose the Donbass, but other regions as well," the magazine writes. According to Expert's journalists, Ukraine needs a new idea for the development of the country. However, Petro Poroshenko "has not assumed this responsibility and left his comfort zone." The magazine points out that in his speech, the Ukrainian leader once again highlighted the thesis that is most convenient, that is, that the current conflict in Ukraine was initiated from outside and was the result of Russia's imperial ambitions. Expert says that President Poroshenko's planned reforms within the Strategy-2020 Program can only be implemented with strong central power and the presence of an efficient state-building project. Ukraine has neither, underlines the publication. Nezavisimaya Gazeta reports that Petro Poroshenko is trying to retake Crimea in a peaceful way: Ukraine has offered the peninsula economic privileges. Kiev has officially recognized Crimea as a free economic zone with a special fiscal and emigration regime. Experts say, however, that this regime will unlikely be able to take effect on a territory that is not controlled by Ukraine. The newspaper explains that the law includes a multi-currency regime in the free economic zone, as well as a special regime on the internal and external migration of individuals and the special application of Ukrainian fiscal and customs legislation. Nezavisimaya Gazeta reminds its readers that the Russian government is also planning to create a free economic zone in Crimea. "It is still difficult to say if these special economic regimes will overlap and whether Russian and Ukrainian benefits will contradict each other," writes the newspaper. According to experts, the new law shows Ukraine's determination to confirm its territorial claims and strengthen its position in the region. "This move is designed more for the Ukrainians themselves," says one of the experts. "The government is demonstrating that Crimea's destiny is still important for it."